Premier Bride Planning Guide? Yes, please! We are always excited to announce that our newest Premier Bride Magazine is available, and this time is no different! There are loads of great tips, beautiful gowns and an abundant list of wedding professionals to choose from. Most importantly, it’s all wrapped up in a perfect sized magazine that can easily slip into a messenger bag, tote or handbag. Now, if you’re like I was, you’ll carry this poor little magazine everywhere, until it resembles nothing more than a tattered, shredded mess to the untrained eye. But we know differently. That little book holds plans, dreams and ideas, all of which will eventually become your wedding. Some brides may prefer to keep all of their information on-line. Not a problem. Premier Bride has a virtual planning tool for you to use. Simply register (a quick & simple process!) on www.pbcv.com. Here are the benefits of registering for FREE with Premier Bride. This site also features a downloadable version of this planner. Whether you plan on toting your book along with you, keeping everything organized on-line or BOTH, Premier Bride is here to help you through all of the planning stages. 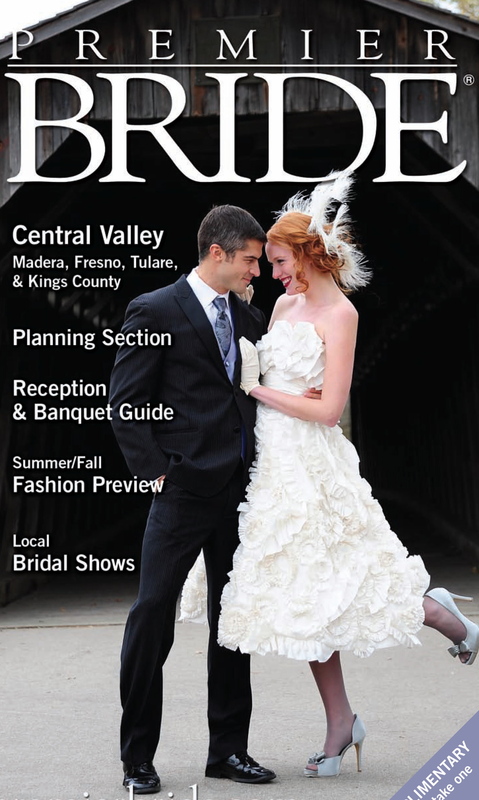 Pick up your copy at Premier Bride’s Wedding Center , any of our advertiser’s businesses or during our upcoming Premier Bride’s Showplace , Sunday, August 21st, 2011. Wedding photography isn’t what it used to be…and believe us, that’s a great thing. While all wedding photos are special, the current take on photojournalistic style pictures help create a rich vision of the couple, their life together and snippets into their quirky sides. Instead of being front and center, some couples are sharing their spotlight with weathered barns, wheat-filled pastures and mammoth trains barreling past them. Photo Booths: Yes, we know…this has been around for a while. But you can’t deny the fun to be had with silly hats, feather boas and fake mustaches! Fine Art Photography: This is an excellent way to show off the dress and personal style. Set up like a fashion shoot, brides (and grooms for that matter) can let their inner runway model loose and have some amazing shots to show for it. Paparazzi (or Proposal Style): I’m calling this Paparazzi Style since it’s usually not expected and used to capture a proposal in action. Fun and fast, it will document an event that you’ll love to re-live together again and again. 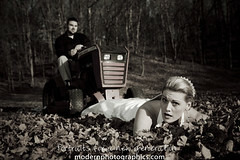 Trash the Dress: If you’re the sentimental type, you may want to move on past this style. If you’re a bride that loves art, this is for you. Instead of sealing your gown for future generations that may or may not (gasp!) love your dress, you trash it. The photographer captures every splash of dirt and every splatter of paint as it lands on that beautiful fabric. Awesome. Cherish the Dress: Obviously the opposite direction of trashing the dress, cherishing the dress shares similarities to fine art photos. Dress up, find a fabulous location and smile! No matter what style you choose or where you decide to have photographs taken, make sure you take the time to interview several photographers. By understanding what style photos you’re looking for, your photographer can provide you with shots you’ll cherish a lifetime. A loyal fan of ours suggested we start writing some posts about famous brides from history. Obviously, we thought it was a brilliant idea, so we decided to begin with one of the most famous – Grace Kelly. Grace wore a Lanvin ball gown to the Monaco Opera on 18 April, following the civil ceremony. The gown, made of hand-embroidered white silk organdy, had a V-shaped decollette, a high waistline, a full bustle in the back, and was decorated with 800,000 sequins and 1,500 pearls and rhinestones. The shoes paired with Grace’s wedding dress were from Evins, New York, and were designed by David Evins. A copper penny was built into the right shoe for good luck. A popular belief is that Grace wore flats so that she would not be much taller than Rainier, these shoes actually have 2 1/2″-inch heels. 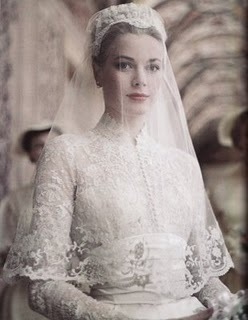 Most recently, Grace Kelly’s (or Princess Grace) name was mentioned in conjunction with another highly anticipated wedding, that of Prince William to Katherine Middleton. From the style of dress to quiet elegance, the similarities were noticeable. In particular, the simple, yet extremely elegant style of gown chosen by both has been widely reproduced and copied. Elegant Jelly Shots? Yes, please! When I first came across this site earlier this morning, I had mixed feelings. Could an elegant, molded jelly shot take the place of the classic lime/cherry/lemon shot housed in the ever glorious Dixie paper cup? The Jelly Shot Test Kitchen is creating beautiful, delicious concoctions for savvy soirees. 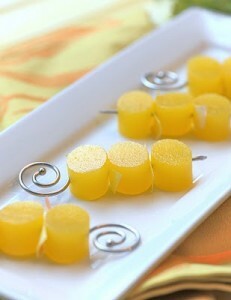 Here we feature one of our favorites – a Mimosa Jelly Shot. How fabulous would this be at a bridal brunch? Pour juice and sugar into a small saucepan and sprinkle with the gelatin. Allow the gelatin to soak for a minute or two. Heat over very low heat until gelatin is dissolved, stirring constantly, about 5 minutes. Remove from heat. Stir in the champagne. Mixture will be foamy – don’t worry, this will dissipate as the mixture sets. Add the drop of orange flower water if desired. Pour mixture into pan and place in refrigerator to cool. So. You’ve gotten engaged…now what? In addition to the excitement surrounding a newly engaged couple, comes the reality. You’ve got a wedding to plan. Not only will this be a wonderful and fun undertaking, it will showcase who you are as a couple. To begin the task of planning, a great place to start is a bridal show. Most shows take place in January, February and July & August. Since planning normally takes about a year to a year & a half, most couples can attend one or several of these shows. Bridal Shows are a great place to see the newest trends in the wedding world. Whether you’re seeking a unique venue, a photographer that suits your style or a vendor specializing in lighting design, you’ll find several options here. Here we offer 10 tips for getting the most out of a bridal show. Pre-purchase tickets: By pre-purchasing show tickets, you’ll save time. With your ticket already in hand, it’s one less step you’ll have to go through when arriving at the show. Arrive early: Arriving early is a great way to be eligible for more than one prize round. Many shows have giveaways throughout the day. Invite people: Many brides ask their fiancée, friends and/or family to attend the show with them. Having people there to bounce ideas off of makes the entire planning experience much more fun. Contact Labels: Vendor tables at bridal shows can range from 20 tables to over 150 booths at large shows. Make sure to bring labels with your contact information (name, email address, phone number and wedding date work fine) to place on the many sign-up sheets and prize entry forms you’ll be filling out. Take notes: Many brides today have technology on their side. Use your phone’s notebook capabilities to take notes and visit websites of vendors you meet along the way. Stay on budget: By discussing your budget before the show, you can attend knowing where you want to save and where you want to splurge. Know what’s important to you: Is having a wedding video or beautiful photographs at the top of your wish list? Or is the foodie in you dying to offer the ultimate gastronomic experience for your guests? Know what is most important to you and visit these vendors early on. Talk to the professionals: If you’re wondering about a service, don’t be afraid to ask. Get all the details up front so you know what the vendor can or cannot offer. Bring your checkbook: Booking services at a bridal show can be a wonderful thing. Many vendors offer show discounts and specials. Have fun! 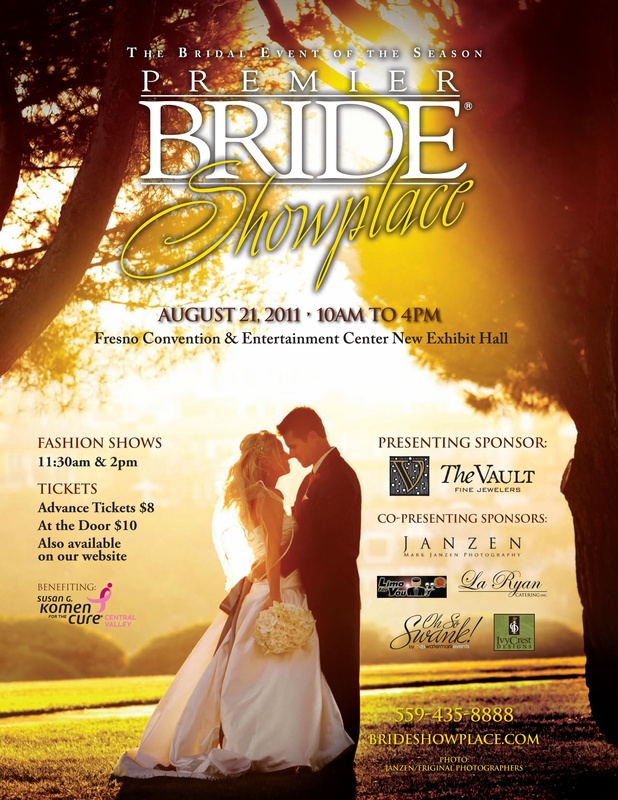 Make a day out of your bridal show visit. Make plans to stay for several hours so that you can visit each vendor, register for prizes and attend the fashion show. Photo credit Mariano Friginal Photography.